2018 is off to a busy start. Rathmore has wrapped on its St. Paddy's month gigs, there are more in the works for this year. My home studio (temporarily titled Whakatane Studios for the town in NZ) is cranking. Releases to date include Kill Ritual, Sault, Wings of Dahak, Rathmore, and others, in the works is music for Courtney Cox, Deathriders, Gustavo Dobles, Chris Menta, and Battle School Launchy. King Diamond is taking the year off from playing live to concentrate on a new DVD and a new album, so I can spend the extra time tickling my now 5 year old daughter. Contact me for: lessons, live or remote, gigs, drum tracks! Update: Stardate July 2017, So far this year played 2 shows with King Diamond. 1 in Mexico City, 1 in Brazil. Both were amazing shows. In Mexico we lost Erling Sibbern, King's head of security and assistant since long before I joined. Erling and I became great friends in the years that I knew him. He loved my daughter and would spent lots of time with her. I'll miss you Erling! Whakatane Studios, my home studio has been a great addition. There are some projects I played on that will be released soon and some that are ongoing. Kill Ritual and Wings of Dahak will be released in the fall. My tracks with Deathriders (Neil Turbin, the original Anthrax singer) are sounding amazing and that is ongoing. Contact me for information, let me play on your tracks! Aghora 3 is nearing completion and we hope for a release this year. Shaolin Death Squad remains active, we have a show August 3rd at Lola's in Ft. Worth. My Celtic rock band Rathmore has some exciting announcements impending. I am always accepting students locally and through Skype/Facetime. We did the Rockstar Mayhem festival in June/July/August, what a great time getting to know so many great people and playing every night in-between Hellyeah and Slayer! Check out the video Sick Drummer made of me here. The King Diamond fall Abigail tour has been announced, we will tour with Exodus! The new Shaolin Death Squad e.p. is almost finished!! Contact me if you need drum tracks or for information about online lessons! We wrapped on King Diamond USA 2014 last week, fantastic tour as always with King. It was King's first time playing in the USA in 9 years, with the result being mostly sold out shows and awesome crowds. All my sponsors (Tama, Paiste, Vic Firth and Remo) came through big time and I played on an amazing kit, just too much fun. You can see my cymbal set up here. It's been precisely 6 months since my last update; Aubrey turned 7 months last week. I'm feeding her Classical, Romantic, Bird and Diz, classic metal like Rainbow, Deep Purple and Priest but she prefers to watch Taratabong. OK, fine. After Japan, we will concentrate on new music until next summer, we are confirmed for Wacken '14. Wacken has always been a goal of mine, either to play OR attend, looks like I'll have a good seat. More European festival announcements are expected to follow. I'm already excited to get back to the metal fests! Shaolin Death Squad will play at the Do For It Records Halloween shows again this year. We are doing Journey this year and it is extremely fun. The White Swan is totally nailing Steve Perry! We are also working on a huge amount of new music, there is some very challenging material. Expect a new CD somewhere around April of 2023. I'm having a blast teaching drums, guitar, piano and vox at Hall Music Productions in Southlake, TX. It's a great facility packed with great teachers, as well as a world-class recording studio. There are some exciting things happening at this place! I also teach privately at my studio in Denton, TX. My daughter just turned a month old. For her first month I concentrated mostly on singles and doubles, and some basic foot/hand rhythms. This month: paradiddles and maybe a Tony transcription. The tours with L.O.D. were great times in 2012, we did two tours with Gwar and one with Fear Factory/Shadow's Fall. All were awesome experiences. Not sure if they were cooler than the NZ tours though. Also in 2012, King Diamond returned. We played at Sweden Rock and Hellfest. 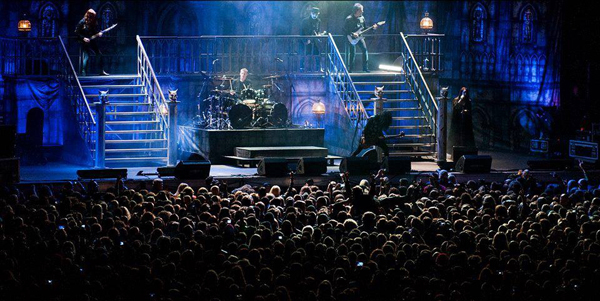 They were great shows, huge crowds. It was a great time for everybody, the whole thing felt like a family reunion. Playing again with Andy, Mike, Hal and King was just nails, man. So...very happy that we'll do it again this year! We do around 12 shows at festivals in Europe this summer. Shaolin Death Squad is working on a lot of new music that is very challenging, so it's good that I started drinking coffee again. Our album "Intelligent Design" is being released on vinyl, so we'll relearn the whole thing and play it live in a few weeks. Cheers! What a year! King Diamond has announced a festival date for next summer in Finland (Tuska Open Air Metal Festival). I am heading out with Legacy of Disorder supporting Gwar, DevilDriver and Cancer Bats (see Tour page for dates). I love touring and am looking forward to it, however, I will miss my students terribly and I already can't wait to get back to them! Just wrapped up the Legacy of Disorder tours with Gwar, Fear Factory, Shadows Fall, Municipal Waste, Kylesa, Ghoul, The Browning and The Devastated. We circled the USA three times, played some great venues, visited Niagara Falls and the Grand Canyon, broke down a lot (the bus, that is) and had an awesome time. I'm currently in rehearsals in Europe with King Diamond for our upcoming shows at Sweden Rock Festival and Hellfest and they're going really well. The new stage set is the coolest yet and the shows will be good fun! Next up: touring, and more touring. Legacy of Disorder will be out from March 20th until the end of May supporting our new album "Last Man Standing", first with Gwar/Municipal Waste, then with Fear Factory/Shadows Fall. From there I'll go straight to Europe for the return of King Diamond. We have two shows booked headlining the second stages at Sweden Rock Festival and Hellfest in France. Hope to see you at a show! 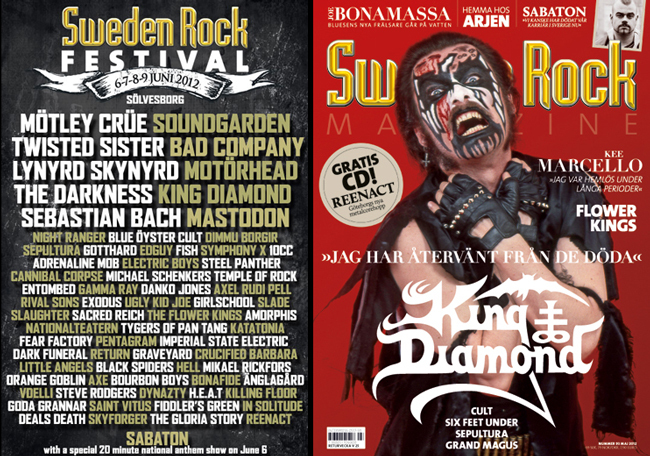 It's been 6 years since the King Diamond band has played live, it looks like this is the year that we play again, first at Sweden Rock Festival and then again at Hellfest in France, both in June. Legacy of Disorder will be announcing a tour very soon. Shaolin Death Squad is playing shows including one this Friday, January 27 with King Diamond as a special guest. We are working on new music. I am still teaching at home, at two private schools, and through Skype. Also, my home studio is up and running! Email me for info. matt at mattthompsondrums.com. 1.21.12: Check out VH1 Classic channel today to see King Diamond and Mercyful Fate in the Metal Evolution series at 10 pm Eastern, 9 pm Central, 8 pm Mountain and 7 pm Pacific time! King will be talking about being on the Filthy Fifteen list, mention a couple of rumours he had heard and more. 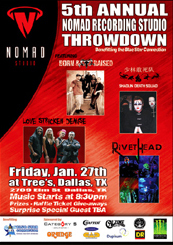 1.07.12: Shaolin Death Squad show added at Trees in Dallas, TX on January 27 as part of the Nomad Recording Studio showcase. 12.07.11: In NZ rehearsing with Legacy of Disorder as we prepare to tour North America in support of upcoming album "Last Man Standing." Warm-up show is on 12.17.11 at The New Hub. 8.26.10: A huge thanks to Petar and everyone in Groznjan, what a great time! I'm home for a few weeks before heading out on another tour with Legacy of Disorder in NZ. I will play in OKC with Arms of the Sun and in Denton with Shaolin Death Squad. 4.20.10: I will be a guest artist/instructor at the Groznjan International Percussion Camp in Groznjan, Croatia this August with Mike Mangini, Mike Haid, Petar Curic and others, see you there! Shaolin Death Squad is currently playing shows.